After a long and Voice-filled hiatus (which didn’t work, if you were wondering; Sean Saves the World and The Michael J. Fox Show did not post better ratings after having a Voice lead-in for three weeks, so it’s time for NBC to go back to the drawing board if they want those shows to prosper) Parks and Recreation came back with two new episodes last Thursday, both of which were wonderful in their own unique ways. Since they were originally supposed to air separately, and not as a one-hour special, I’ll tackle each of them separately. “Filibuster” centers around a birthday party that Leslie is throwing for Ben. We have no idea which birthday it is for him, but we do know that it’s an early-90’s themed party because, I kid you not: “It’s his favorite era.” It ties in perfectly with the worlds most boring kink: he has a “thing” for women in skates. In hindsight, I shouldn’t have been too surprised by this theme. This is the same guy who played “Whoomp There It Is” at his mayoral inauguration when he was eighteen. Maybe it’s because I was a preschooler for the early 90’s, but I don’t see the appeal. All I remember is terrible fashions and earwiggy music. But Leslie never meets a theme that she doesn’t make amazing, even if that theme seems weird and sorta lame. 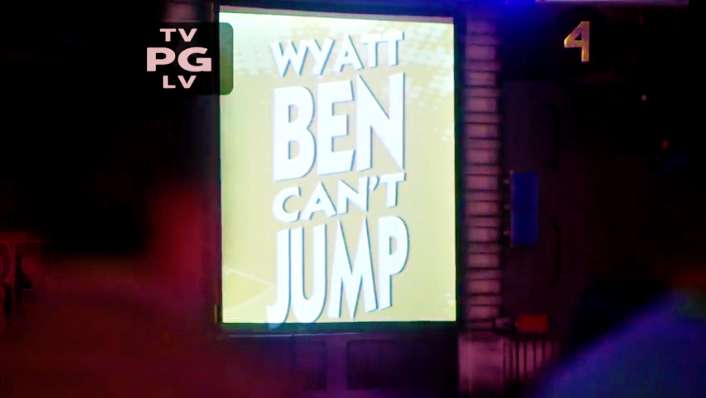 Unfortunately, the Wyatt Ben Can’t Jump party is in full swing at Pawnee Skateland (which really means that four of his friends are skating, two of them are playing an arcade game, and one of them is running around buying stuffed bears… cool party, bro) when Leslie finds out that Councilman Jamm is trying to push through a last-minute vote to ban the former Eagleton citizens from voting. It’s in her best interest to let them vote, since she saved a lot of their jobs, but, well, I’ll get to that in a minute. Leslie is forced to filibuster in order to delay the vote while dressed in unflattering overalls and roller skates. She’s not allowed to sit down or accept help from the audience, and she has to talk the entire time. Easy peasy, except she’s unsteady on the skates, so she sits to take them off, earning her a strike. Jamm bangs a gong, much to Councilman Howser’s ire, but it’s totally worth it because Councilman Howser really nailed his side-eyes. I stopped in the middle of writing just to gif this, because it needed to exist. The citizens of Eagleton show up to support Leslie during her filibuster, but after Chris (dressed in amazing acid-washed denim) thanks them for supporting her in the recall, they inform him that they want to retain the right to vote so that they can vote Leslie out and vote a former Eagletonian in. Chris and Ben get the info to Leslie (which earns her another strike, thus another gong strike, thus another epic Howser side-eye) which sends Leslie sprialling. Ultimately, she decides to do the right thing and fight for every citizen’s right to vote in the recall election, even though it means she’s pretty likely to lose. She succeeds in filibustering, dumps a pitcher of margaritas over Jamm’s head, then runs off for an epic bathroom break. The storyline ends with her finding out that Ingrid (Kristen Bell) is the nominee to run against Leslie in the recall. The B plot was Andy’s 19-hour visit to Pawnee to see April. They’re delighted to see each other and they even attend Ben’s lame party (even though April claims to have thought it was a 1690’s-themed party and dressed up as a Pilgrim), but the twist comes when it’s time for Andy to leave. The taxi only makes it two houses down the street before it stops, Andy jumps out, and he leaps into a dumpster. It turns out Andy has no idea what he’s doing in his job, and it terrifies him. April reassures him that everyone’s basically faking it until they make it, and it’s a really sweet reminder of how their marriage works and how great it is. It’s also nice to see them overcoming the distance. 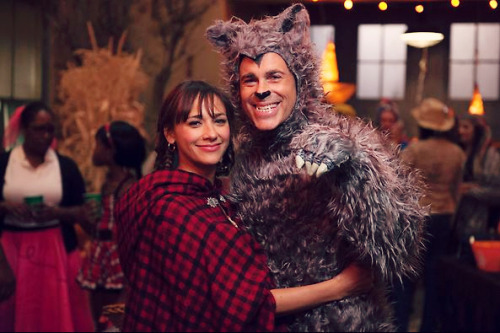 April and Andy married so young that it would be easy for this show to play on any perceived immaturity and take a negative stance on young marriage, especially over long distance, so this is truly refreshing. As they eat the animal Ron shot, Donna asks if he wants to go back to the party and work on winning the game. The episode closes with both of them standing at the game, long after the party is over, and Ron finally beats the game and lands in the top score list. After he tells Donna that his initials are private, she suggests he just put in three random letters. Ron’s letters? “A.S.S.” Proof that men never really grow up. This is your reminder to watch Orphan Black. My personal favorite part of this episode is the return of Tatiana Maslany as Nadia, Tom’s temporary girlfriend. She’s leaving for Rwanda soon, which has Tom freaking out because he likes her so much, so after she suggests that he win her a big stuffed bear by playing skee ball, Tom is determined. Unfortunately, there’s a sub-plot of Ann, dressed as Blossom, running around buying bears and talking about being an adult. (It’s storylines like these that make it painfully obvious why Ann is getting written off the show… if there was really nothing better for her to do, then I guess I shouldn’t be so sad that she’s leaving.) Ann walks up to Tom with the bear in her arms, yammering about how she taught herself to make out on her old bear (and that’s what she wants for her unborn child?) and Tom freaks out, because obviously Nadia’s going to forget all about him in Rwanda if she doesn’t have a giant teddy bear to remember him by. Then Ann steals the bear back because really, what else is Ann going to do? Bye, Tatiana. We hardly knew ye. “Recall Vote” is about, well, the recall vote. Long story short: Leslie is recalled. It was actually a surprise for me, I think because I hadn’t given the actual recall a lot of thought even though it’s all anyone’s been talking about for the last few episodes. But the votes were stacked against Leslie and it shouldn’t have been a surprise at all. She doesn’t take the news well. 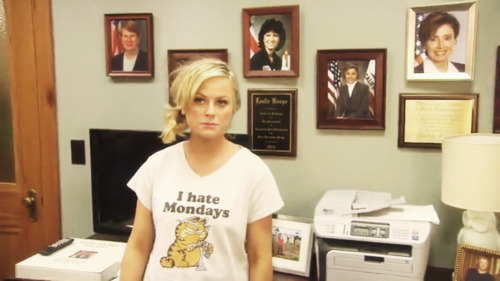 She arrives the next morning in sweats and a Garfield “I hate Mondays” shirt while she eats a Paunch Burger. Ben and Ann, having formed the Leslie Knope Emotional Support Task Force, scramble to help Leslie recover, but the fact is, where Leslie is capable of unbridled happiness and sunshine and rainbows, she’s also capable of deep depression. Losing her city council seat is no small thing. Ben tries to refocus her attention on the haunted house–Did I mention it’s Halloween? Yeah, it’s Halloween, never mind that it’s November 14th, thanks a lot NBC–but Leslie decides to go fall asleep on a bench in the courtyard. I won’t lie, I was a little envious of her in that scene, she looked so peaceful passed out on her stomach on a concrete bench. Then in an unprecedented second episode with a Ron/Donna storyline, Donna comes in screaming about how Ron is “in Bloosh!” Bloosh is apparently a weekly lifestyle email written by a Pawnee woman who lived in someone’s pool house in L.A. and came back with the sense of entitlement that goes along with that. It’s actually really funny, especially once we meet Annabel herself, who is basically GOOP with better hair. (Yeah, I said it.) Apparently Annabel GOOP loved one of Ron’s rocking chairs and declared it “THE must-have item of the season.” Ron, predictably, is nonplussed, but when Tom begs him to follow through with the Bloosh piece so that Tom can try to get Rent-A-Swag into the issue, Ron reluctantly agrees. He goes on Pawnee Today with Joan Callamezzo, who is starry-eyed for Annabel GOOP. Ron’s horrified by the entire fiasco, asking Tom, “Did that woman call my chair ‘delicious’?” Later, at a pretentious and neon blue party, Annabel GOOP is trying to persuade Ron to mass produce his chairs. He explain that his chairs are so quality because they are hand-made, then he tries to divert her attention to Tom. She’s not interested in Rent-A-Swag for this issue, and tells him that maybe he can make it into her spring catalog. That’s too late to be of any use to Tom, and Ron patently refuses to mass-produce his chairs, so Annabel GOOP declares the party over. “It no longer is… it was.” That’s okay, Donna’s stocked up on the free swag from the party. Leslie, dressed as Buttercup from The Princess Bride, listlessly hands out candy at the City Hall haunted house before she’s ushered out by Ben, dressed as Westley, who takes her to a bar. They get drunk and stupid together as Leslie shouts that they’ve both already peaked. She drags down Ben with her (he wonders if he peaked at 18) and they both decide to get tattoos at the pawn shop with the creepy guy who tried to buy Ann at Jerry Larry’s Fart Attack fundraiser. They narrowly avoid the diseases they would’ve undoubtedly gotten when Ann arrives just in time to drag them out of there. Ann sits Leslie down and makes her read a letter in order to face the hard facts: in 30 days, she will no longer be a city council member. “But I am Leslie Knope. I am more than a city counselor. I am an unstoppable force of energy. And I will use those days to work as hard as I can.” Ann points out that Leslie has a lot of projects to finish up in her last month in office. I’m really gonna miss Ann. The episode ends with Leslie giving her jabroni-less concession speech. Later, Ann explains, “She is like a toddler, bouncing back from a nap” before Leslie reappears with a list of things to do, as well as two pumpkins carved with their likenesses. Is there anything Leslie can’t do? I’m curious about what’s going to happen for Leslie next. Her last month in office will take us through to the winter hiatus, so hopefully come January, we’ll see Leslie tackling something bigger and better than a city council seat. I don’t know where she can go from here at this stage, but I can’t wait to find out. I’m really loving the bit that Jerry is now Larry; even Chris sticks to it, as he calls him “Larry” multiple times in the episode. Poor Larry Gengerch.